Conrad Michael's $10,000 reward to prove him wrong about contrails. Discussion in 'Contrails and Chemtrails' started by Asylumkid, Jul 4, 2015. Well I'm up to 2:41 and he's already made a major blunder. He says "the process by which a contrail is formed is sublimation. The process by which a persistent contrail is formed is the opposite: desublimation." Totally incorrect. Sublimation refers to a solid turning directly into a gas, eg when CO₂ dry ice turns back to gas, or snow "evaporates" on cold dry days with no melting. So how can a contrail form by sublimation? That would suggest solid (ice) turning to gas (water vapour). Ice is visible. 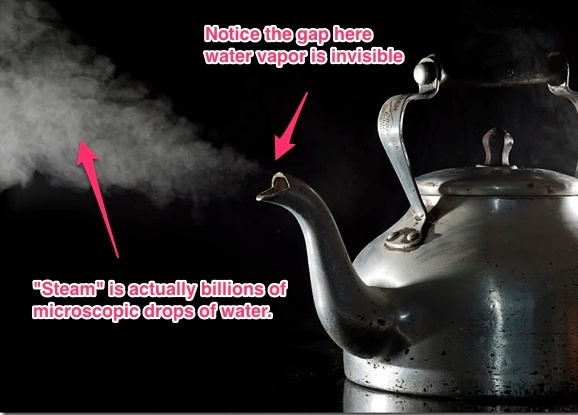 Water vapour is invisible. Sublimation is actually the process by which contrails DISAPPEAR. Both persistent and non-persistent contrails initially form by the opposite process: water vapour turning into solid ice (via the liquid phase). If the surrounding air is dry, the resulting ice will then sublimate and disappear. If it is humid, then water vapour will deposit (or desublimation) into the ice instead, making a persistent trail. Next: the parameters he gives at 3:40 are not correct. The altitude is irrelevant. What is important is the temperature and the humidity. 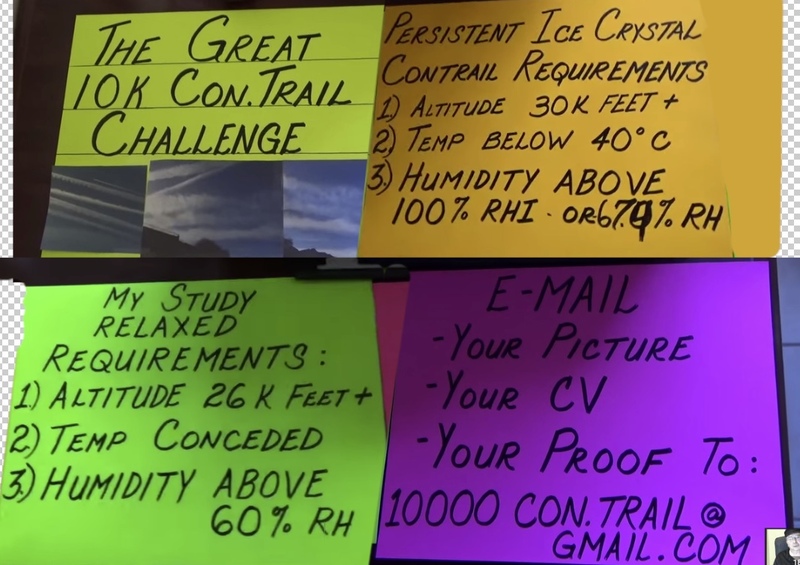 You can get persistent contrails well below 30,000 feet in cold regions. does the altitude affect the air pressure and does that make a difference? 3) humidity above 100% RHi, which he equates to 60% RHw. The Appleman chart extended to ground level clearly shows that persistent contrails can and do form where not all those parameters are met. If it's cold enough, the altitude can be lower (30,000ft = about 300mb). Likewise, if the temperature is below about -33°C then you can get persistent contrails at sea level (1000mb). He also quite clearly doesn't understand that radiosonde data has a dry bias in the upper atmosphere. I could do with $10,000 right about now. Thanks Mike! Is it $10,000 to the FIRST one to show where he is wrong, or to EVERY person who shows him? And, from the chart, if the temperature is low enough you will ALWAYS get contrails, regardless of relative humidity (RHw). He is showing values way below -50°C. Do you have a link to this Appleman chart? Is this from the Appleman 1953 article? I tried to find it (with google scholar) but I can't find the article itself, only later articles referring to it. OK, on watching the video again, the temperatures weren't as low as I said, although it is hard to see as he deliberately pans the camera down quickly and often avoids showing the temperature column. His whole video, though, is based on the misconception that a single atmospheric sounding characterises the atmosphere over the whole area for several hours. That is quite clearly nonsense. Even if the sounding provided a reliable measure of the humidity (which it doesn't), the humidity can change from near zero to total saturation within just a few dozen miles and/or a few hours. For instance see these upper-air humidity charts for the USA today. They show the humidity at 300 millibars, or about 30,000 feet. The two charts are just six hours apart. Notice how (a) the humidity varies hugely over small distances, and (b) there are many areas that go from dark browns (10-20% RH) up to dark greens (80-90% RH), or vice versa, within six hours. Look, for instance, at western Nebraska and northwestern Wyoming on these maps. Clearly, using a twice-daily weather sounding in a single location to characterise the humidity is pretty hopeless. Of these three parameters, only the last one is 'absolute', as this is the necessary condition for persistence (i.e., deposition of ice to the ice crystals in contrail). At the ice-supersaturated humidity conditions the contrails will persist and spread out regardless of their origin: engine exhaust (from jet or turboprop aircraft, rocket etc.) or aerodynamic contrails. The first two parameters are related to the formation of exhaust contrails. Basically, these are sufficient conditions for the engine exhaust mixing with ambient air and cooling down 'faster' than expanding, so it achieves water-supersaturated humidity at some point and condenses, then freezes into a linear cloud of ice crystals. The main parameter here is the temperature of ambient air, whereas the altitude is largely redundant, as the temperature at altitude above 30,000 feet is normally below -40°C. The other important parameter here is the temperature of exhaust gases, which is determined by the engine. The cooler the exhaust, the higher the limit for the outside temperature for contrail formation. For example, some of the modern turboprop engines are are known to produce contrails at 23,000 feet, where the air temperature is about ten degrees "warmer", -30°C. In addition, aerodynamic contrails also can form well bellow 30,000 feet and persist in the super-saturated ambient air at temperatures above -40°C. In addition, it is recognized in the scientific literature that the sounding measurements from most observation points are unreliable for RH at high altitudes, as was discussed here. Edit: But I do give the guy in the video credit for having put in some effort to look into real scientific sources on the issue. p.s. Is water vapour invisible? I keep thinking of fog and mist and even my kettle boiling, I can see it just fine. What I misunderstanding? What you see is condensation. It is not an invisible gaseous water vapour but an aerosol of tiny liquid water droplets. That's the subtlety I failed to register then, thanks for the clarification. If you look closely at the spout of the kettle you will probably see that right above the spout you don't see any "steam". That's the water vapour. You only see what we call steam once the vapour begins to condense into tiny droplets. 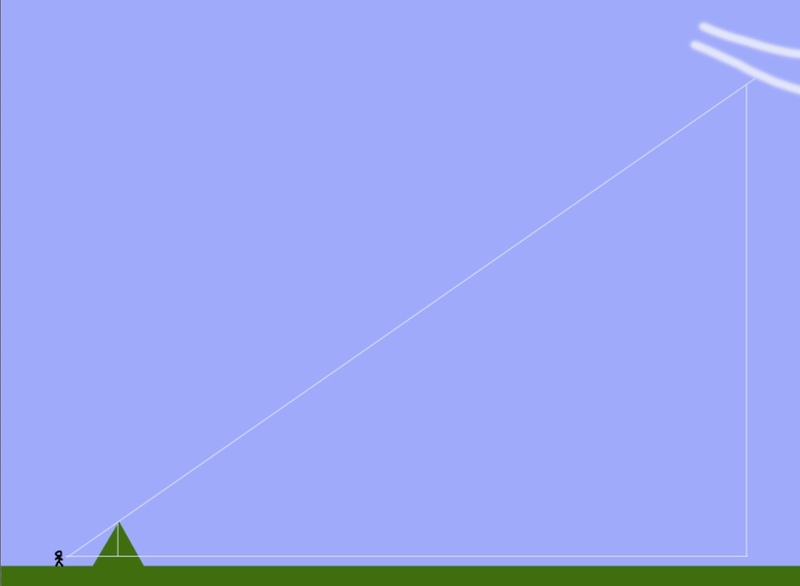 The same principle applies to contrails, where you don't see the visible trail until some distance behind the engine. i'm only answering as ive been waiting to say this ... when rising air cools below its saturation point it condenses. I've got another $50 that says he'll also claim nobody collected. Honestly, I'd be happy with a cheese stained Taco Bell napkin with "TEN THOUSEND DOLLERS" scrawled on it with a crayon if it meant admitting he was wrong. I shall ask for that when I email him. Or maybe one of his flib-boards. I am a bit of a signage collector. I got 100 American dollars says he doesn't pay. Listen to how he sets up the criteria...guy with zero credentials will only deal with PhD holders! without this guy arguing that some minor point wasn't "really" met. "Conrad Michael" or Mike McCoy"...both are claimed. Here and elsewhere on the 'net. Makes it pretty hard to look "this guy" up and see who and how credible he is. Even the 'nam Long-Range Reconnaissance Patrol hat he flashes struck me as odd. "This hat fits me" he cryptically asserts...his sole claim of credibility in a 21+ minute video. to believe that "Mike's" (or "Conrad's") headgear didn't come from the local surplus store. The chemtrail zombie girl... only a select few women are chemtrail emitters. his name is Mike McCoy. thats the link he himself is sharing. edit: sensitive info removed due to public thread. I've always had difficulty with this meme. 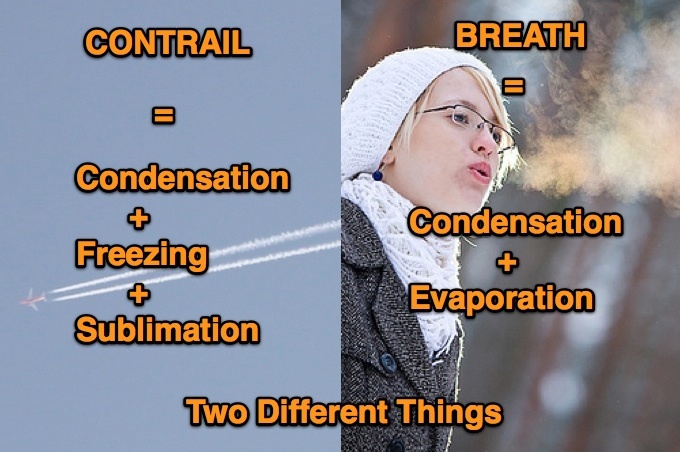 Yes, fogged breath and contrail are different things. For the anti chemtrail myth effort, all of these are important to get across to demystify contrails. That's all in the "condensation" phase, which is included on both sides of the image. Yes, the condensation is the same. The difference is in what happens after condensation. Contrails freeze, and that's what the full article is about, I point out the similarities, and then explain the differences. It's deliberately written in simple language to get the point across. Why can't breath freeze as well if it's cold enough? This isn’t really a property of your breath though, it’s a property of temperature. It you breath out at -40 degrees or colder, then your breath will freeze, and it will not evaporate. Instead of a little cloud that quickly evaporates, your breath at -40 degrees will look like smoke. Like these guys in Siberia, at -52C, you can’t tell the difference between their breath, and cigarette smoke. People will ask why it doesn't freeze below 0 °C. I know, it's supercooling, but that's another concept to explain. well things dont freeze instantly when you put them in the freezer. If they did the beer drinkers would be bummed. "I know they can't do it, what I'm asking them to do." What he says they have to do is disprove things like the Appleman chart. He doesn't understand that his RH figures are wrong. He has been busy removing comments from the video. He isn't very good with perspective either! That bush is 10ft tall, the trails are at 8 feet, ice crystals are a lie! does his explanation help? maybe someone can explain his error. His errors is in assuming the trails are directly above the ridge. They are several miles behind it, probably over 20 miles. He says "The trails is not as high above the ridge as the ridge is above the camera". That makes no sense, you could get the exact same image with a 20' high house instead of a ridge, and it would not mean the trails were at 40'. You need to account for the distance to the ridge, and the distance to the trails. I think he means temperature is way too high, not "atmospheric pressure". maybe. it sounds though like he thinks altitude is a must. if only he had spent as much time reading Metabunk as reading CT sites, he'd know.